Known for its thriving live-music scene and "Keep Austin Weird" motto, the Texas capital is blessed with natural beauty in the surrounding hills, rivers and lakes of central Texas. The New York Times even called Austin one of the greenest cities in America. While Texas may conjure up images of sprawling highways and pickup trucks, downtown Austin has made great strides to become a much more walkable, bikeable capital in recent years. The city council even has a Bicycle Master Plan to increase bike use and regularly holds community walk-and-bike events. Austin has seen a huge population surge over the past five years, but the boom phase has transformed it into a more cosmopolitan city, while still holding on to its unique, funky vibe and friendly culture. 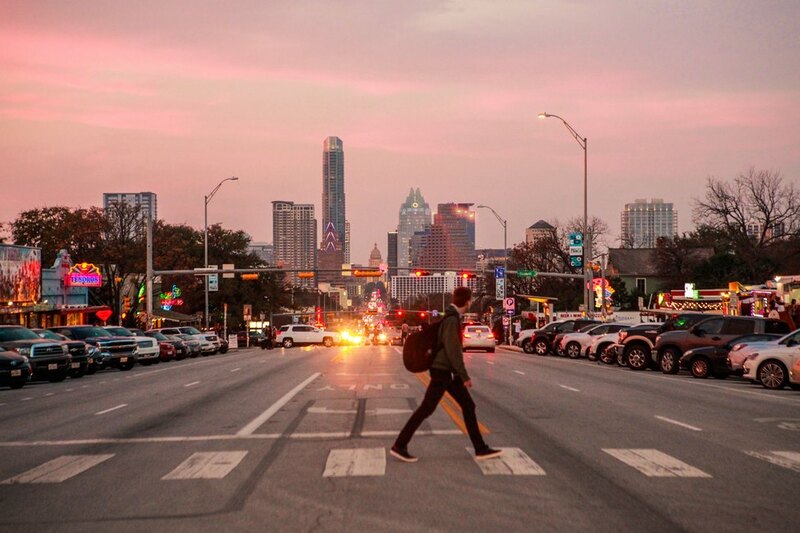 Check out our locals' guide to downtown Austin and experience the "Live Music Capital of the World" for yourself — all while getting in your quota of steps. 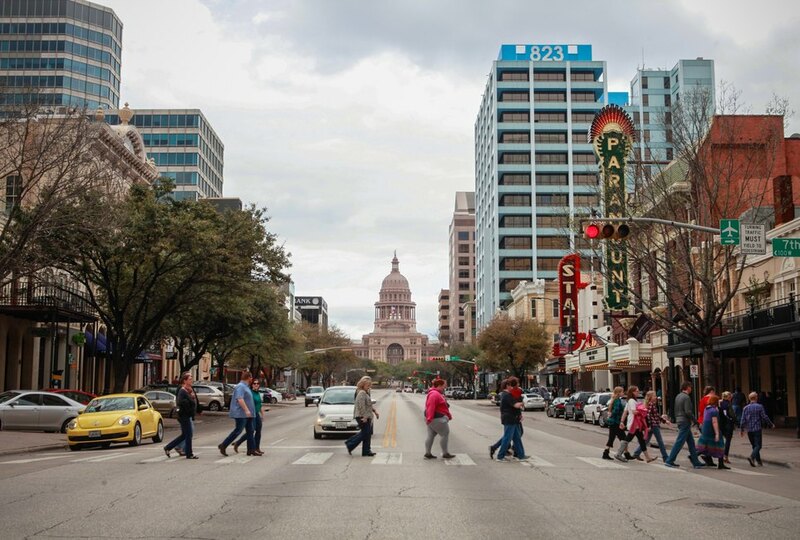 With an impressive Walk Score of 90/100, downtown is the most walkable neighborhood in Austin. Add in the availability of easy B-Cycle bike rentals and the plethora of pedicabs for end-of-day (or night) exhaustion, and you have a central district waiting to be discovered on foot or by pedal power. Downtown has several very distinct neighborhoods within itself, each with something unique to offer. Start your day on Congress Avenue, the main thoroughfare downtown, with the hard-to-miss dome of the Texas State Capitol at one end and Lady Bird Lake at the other. 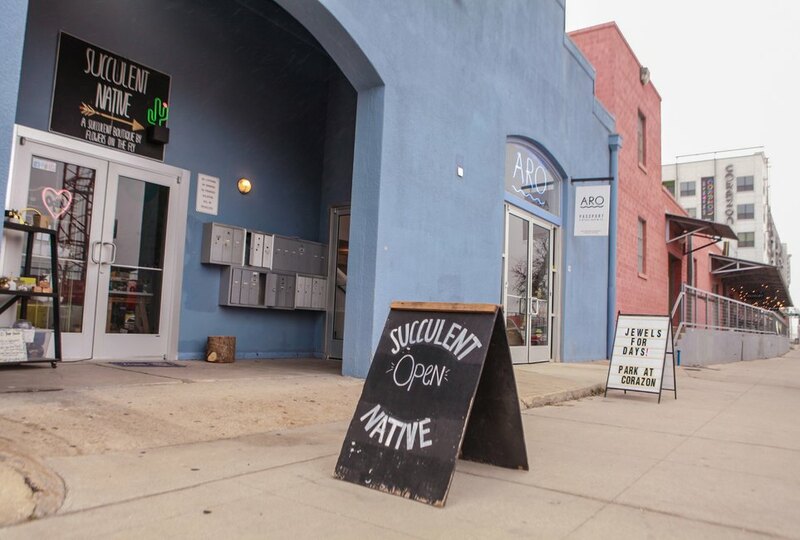 You can fuel up for the morning at The Hideout Coffee House and Theatre, the oldest independent coffee house downtown, serving fresh-brewed beverages and baked goods from local makers. If you come back in the evening, you can take your refreshments (which include beer and wine) upstairs to the theater to enjoy a live performance. 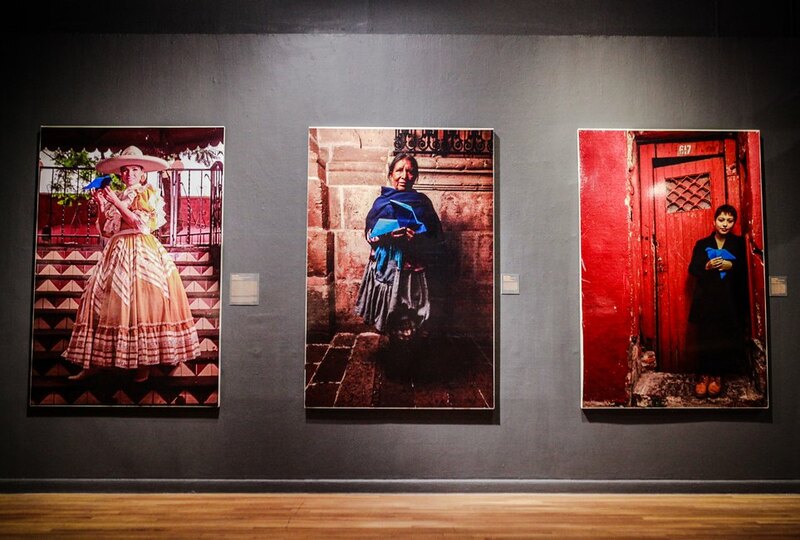 From there, stroll through the leafy Capitol grounds and make your way down Congress, stopping in at shops and galleries, such as the Mexic-Arte Museum, a collection of traditional and contemporary Mexican art with a fantastic shop, and Wild About Music, where you can get your fix of all things melodic and harmonic. 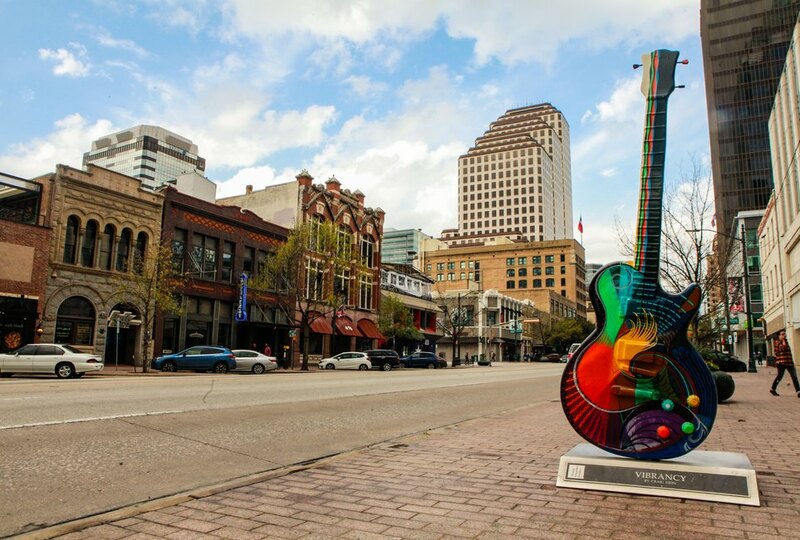 Don't miss all the Gibson guitars dotted around town — each one created by a different local artist as a public art project. You probably noticed them on display in the baggage claim at the airport. You can find "Vibrancy" by Craig Hein in front of Frost Tower at 4th and Congress for a great photo op. 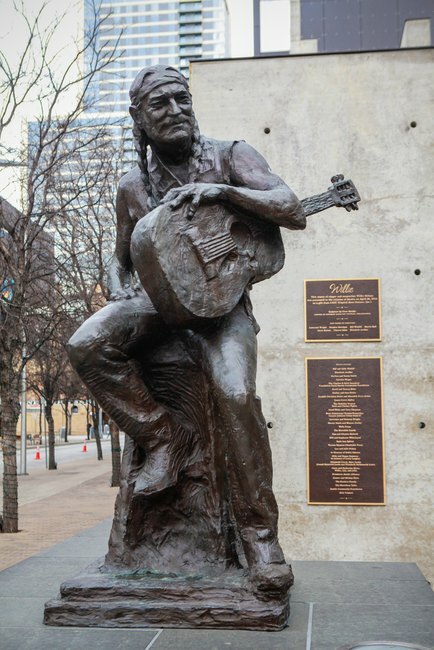 From Congress Avenue, head west to the Second Street District, a bustling mixed-use area with upscale dining, locally owned movie theater Violet Crown Cinema and the new home of the Austin City Limits soundstage — don't miss the bronze Willie Nelson statue out front. 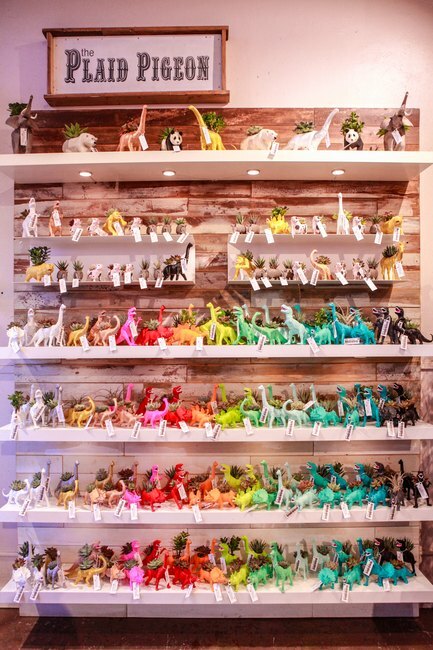 Second Street is also a shopper's paradise, with high-end retail boutiques mixed in amongst funky Austin favorites like Toy Joy, a zany throwback of a toy store that might be more popular with adults than kids. Time for lunch yet? Austin natives love their barbecue, but it's also a health-conscious city and offers plenty of veggie-focused foods and other delicious options. Check out MAD Greens for a hearty Buddha Grain Bowl or a Thai-inspired Siam I Am salad. 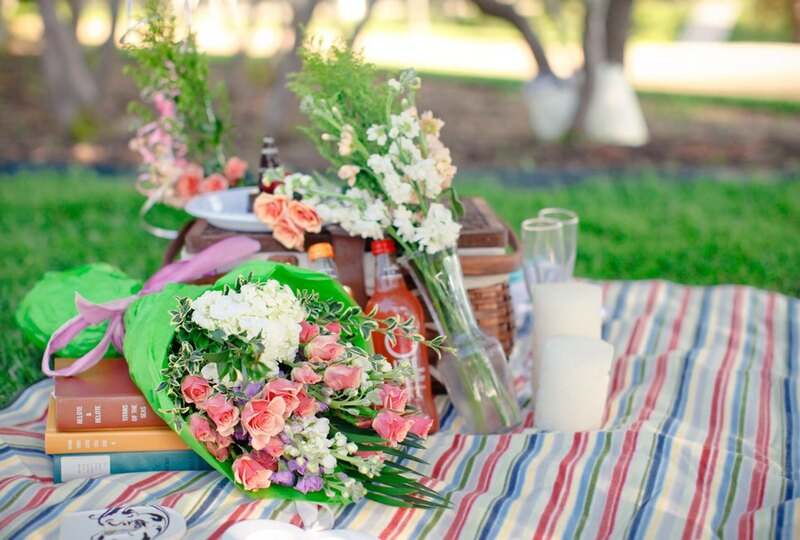 Take your lunch to go and enjoy a picnic along the shores of Lady Bird Lake as you soak up the Texas sunshine. 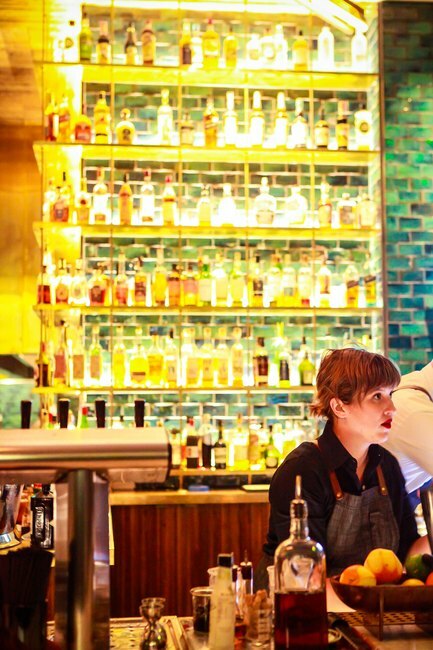 For a midday splurge, La Condesa is a local favorite for authentic, modern Mexican cuisine; here you can go as light and healthy — or as all-out indulgent — as you choose. After lunch, take a break from city life and rejuvenate with some pampering. Head to Hiatus Spa + Retreat on West 5th Street. This oasis of rejuvenation offers a peaceful respite with a full menu of body treatments. Check out its monthly retreat specials. Re-up afterwards with a smoothie from the original Whole Foods just down the street on Lamar Boulevard — the chain was founded in Austin in 1980. As it gets toward evening and you're ready to rock, start by exploring the Sixth Street Entertainment District, or "Dirty Sixth" as the locals call it. 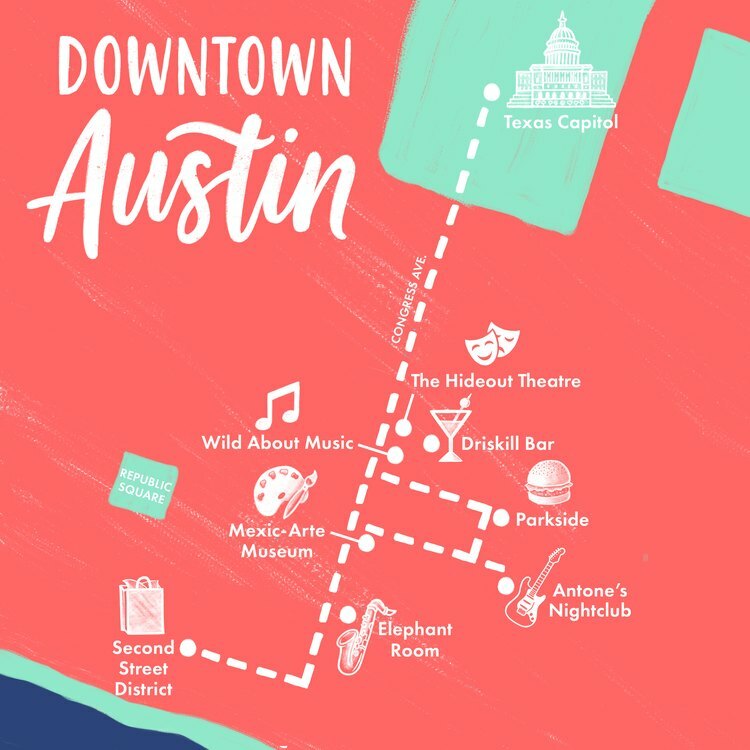 This is where you'll find all the bars and live-music venues that Austin is famous for — and where many of the most popular festivals and events, including the SXSW Festival every year in mid-March, take place. 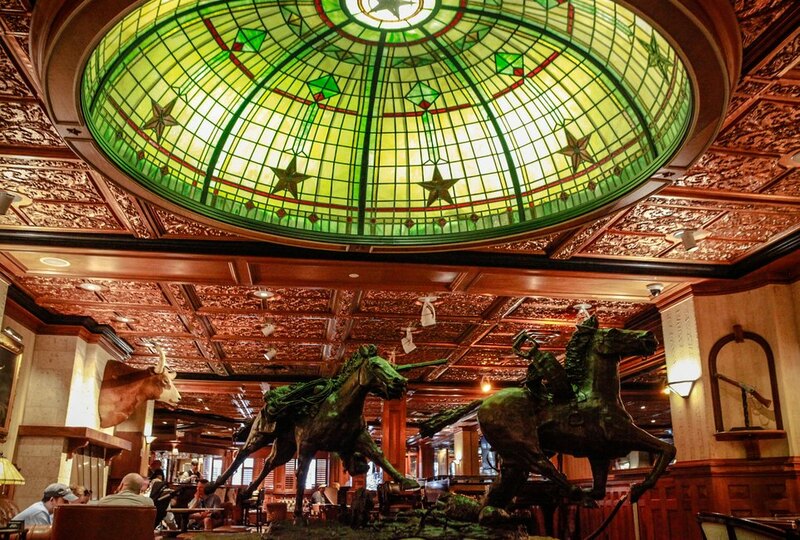 In between the busy bars and clubs, you'll also find the beautiful Driskill Hotel, a piece of history dating from 1886 (and often said to be haunted). Stroll through the lobby of this "Grand Dame" to admire the stunning stained-glass dome, marble columns and original bank vault. 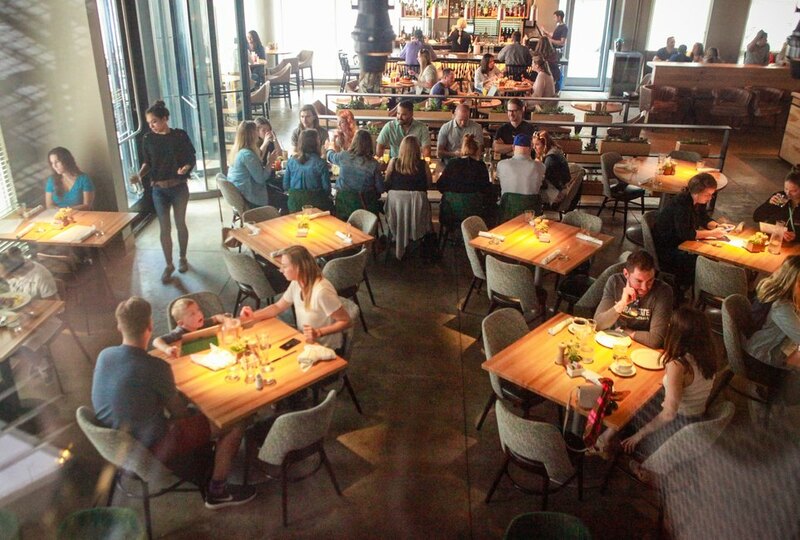 For dinner, check out Parkside Restaurant from beloved local chef Shawn Cirkiel, who introduced the farm-to-table concept to Austin long before it was a buzzword. 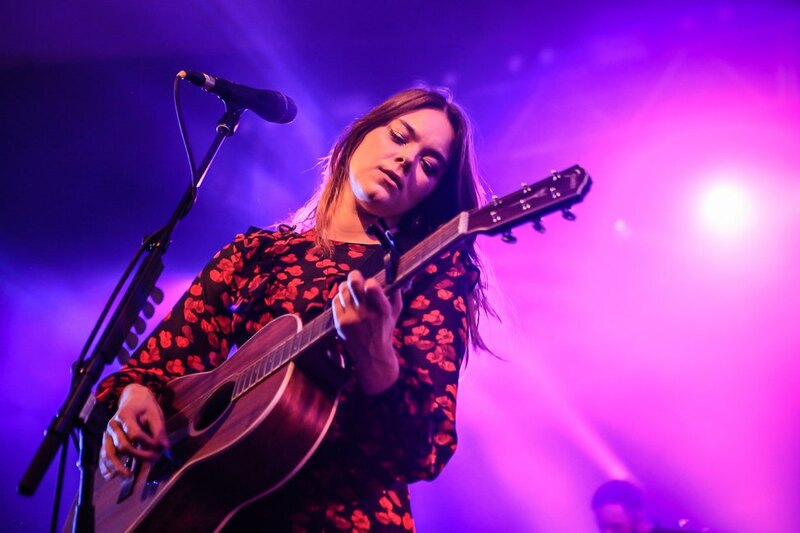 Time to indulge in some of that famed live music? Your choices are nearly endless (and overwhelming), so consult the ever-reliable Austin Chronicle for suggestions. You can't go wrong at the venerable Antone's, known as the epicenter of Austin's live-music scene, Stubb's (also famous for its barbecue) or the Elephant Room, a basement jazz lounge. 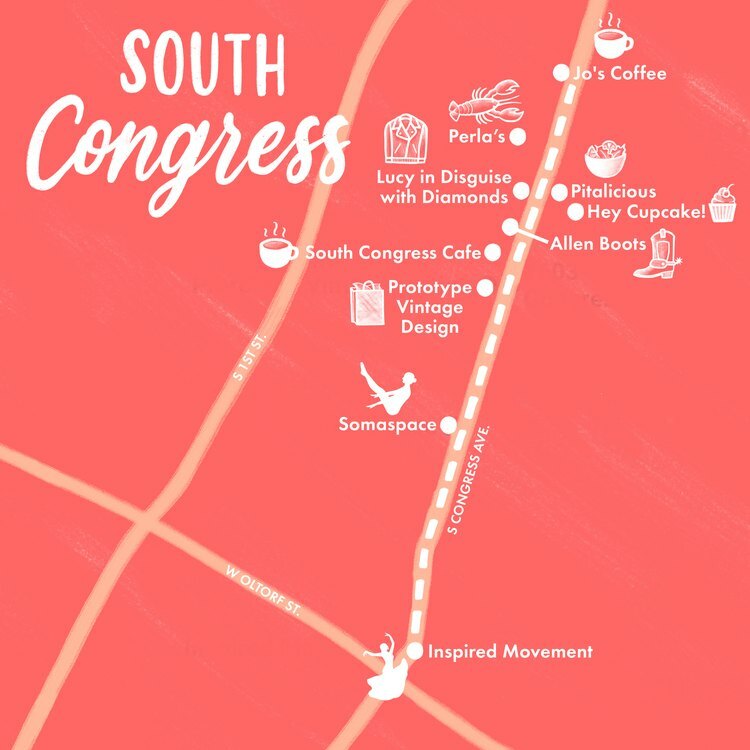 If you cross over the bridge on Congress Avenue, to the south side of the river, you'll be on the "hip strip" of South Congress -- SoCo to locals. 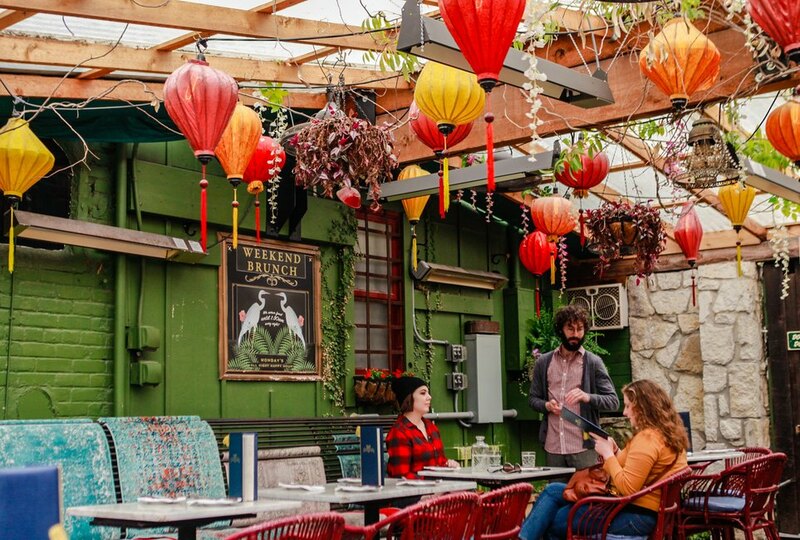 This vibrant, eclectic and thoroughly Austin neighborhood provides the perfect walkable day or evening, home to numerous boutiques, vintage stores, restaurants and clubs. 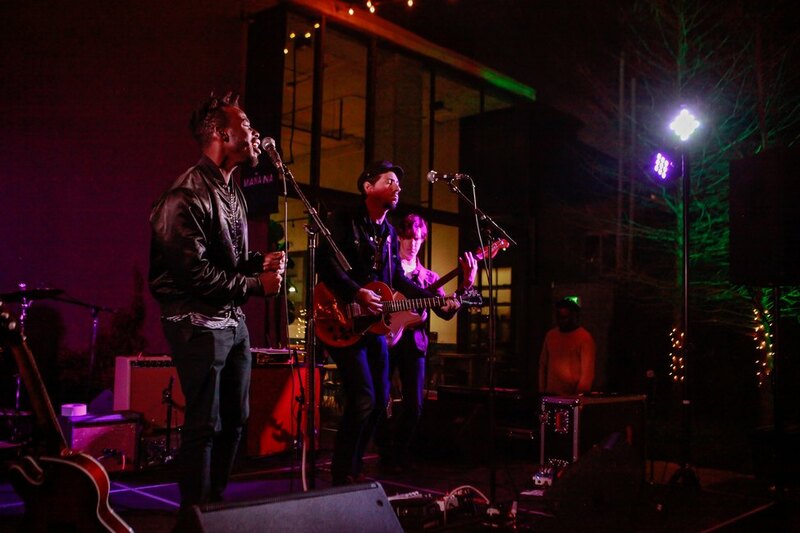 It's especially popular on First Thursdays, when a monthly street fair pops up with live music, art and craft vendors, and more. The perfect place to start the day is at one of Austin's most iconic murals, the famed "I love you so much" green wall on the side of Jo's Coffee. Get your must-click Instagram shot here, then grab some coffee and breakfast tacos at Jo's. 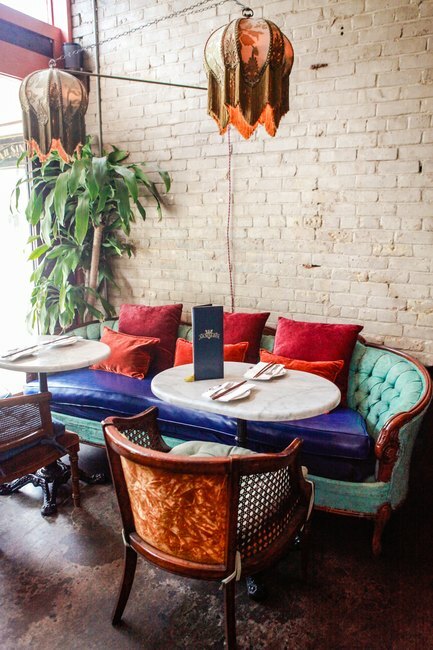 Or, if you're more in the mood for a leisurely brunch, head south one block to South Congress Café, home to delicious food and what's been called the best Bloody Mary in America. Once you've fueled up, you're ready to meander up and down both sides of Congress — always interesting, you never know what street performers you might run across. 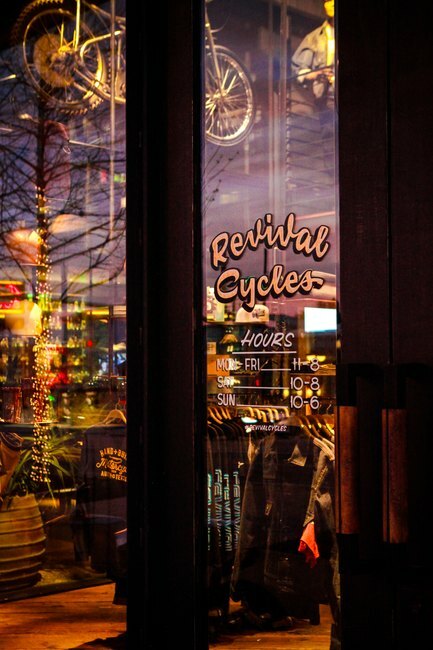 If vintage style is your thing, treasure hunt at Feather's Boutique for high-quality, curated vintage clothing, or Prototype Vintage Design for secondhand clothing and home furnishings. 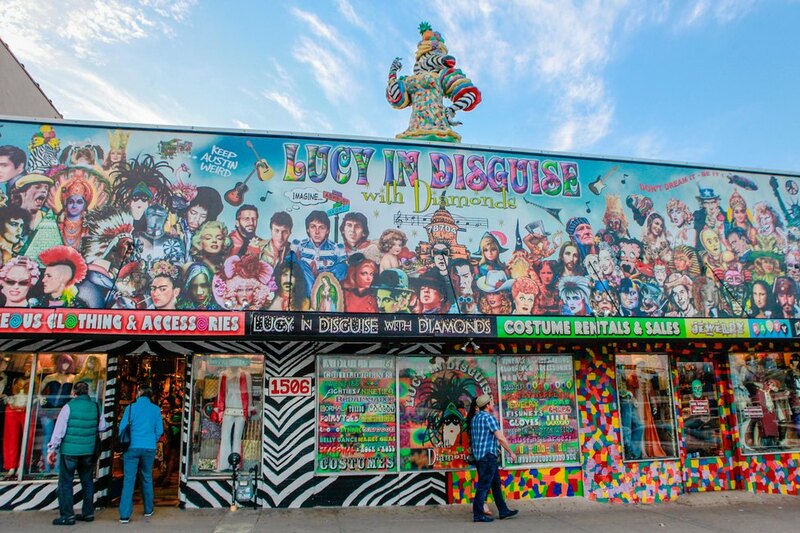 One kooky stop is Lucy in Disguise with Diamonds -- it's no ordinary costume shop. 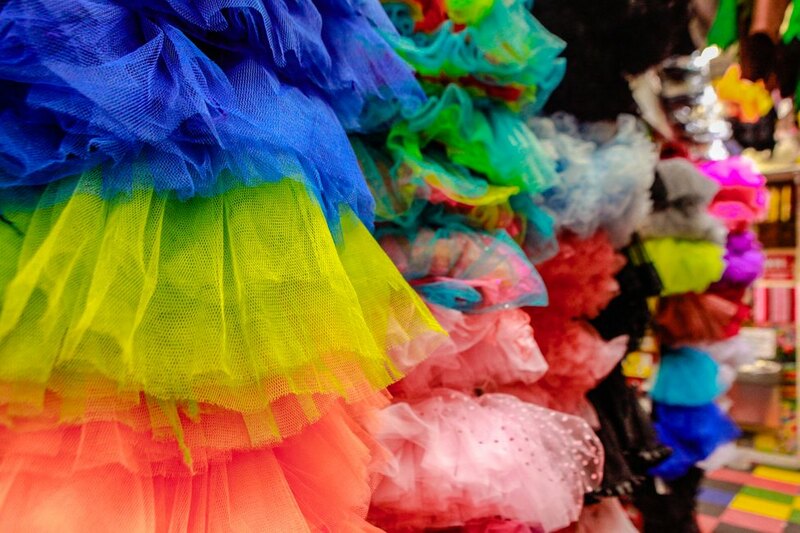 Besides the huge selection of costumes, this fun zone is filled with accessories, thrift treasures and jewelry. If designer duds are more your thing, recent years have seen the addition of many upscale boutiques. 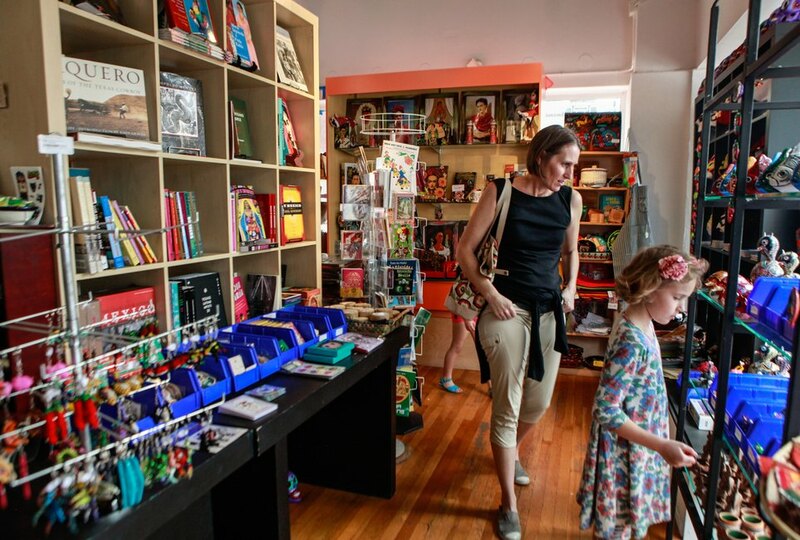 At Parts & Labour you can browse hip clothing and accessories; this is a great place to pick up Austin-themed items. Blackmail Boutique and Atelier is a working design studio that makes gorgeous handmade, one-of-a-kind clothing all on premises. If you're in the market for real Texas cowboy boots look no further than Allens Boots, which has been in this location since 1957, with more than 4,000 pairs on the shelves. When time rolls around for lunch or dinner, you have a wide variety of options. Austin loves its food trucks, and SoCo is no exception; check out PitaLicious for awesome Lebanese food. 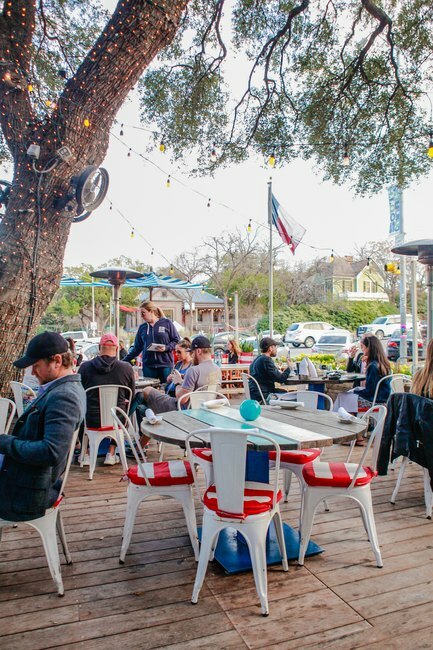 Casual favoritesinclude Guero's Taco Bar, serving classic Tex-Mex food along with killer margaritas and a tree-shaded outdoor patio (and Bill Clinton's fave Austin eats! ); and Hopdoddy Burger Bar, which is known for its long lines that often stretch around the corner. Got a sweet tooth? Hit up the old-fashioned Big Top Candy Shop or Hey Cupcake!, adorably housed in a vintage trailer. There's no shortage of high-end restaurants, either. For seafood on one of the city's best patios head to Perla's, with fresh fish and oysters flown in daily (be sure and take a peek at their amazing aquarium). When it's time to work that off, book a Pilates session at Somaspace, or check out Inspired Movement dance studio, offering drop-in group classes. 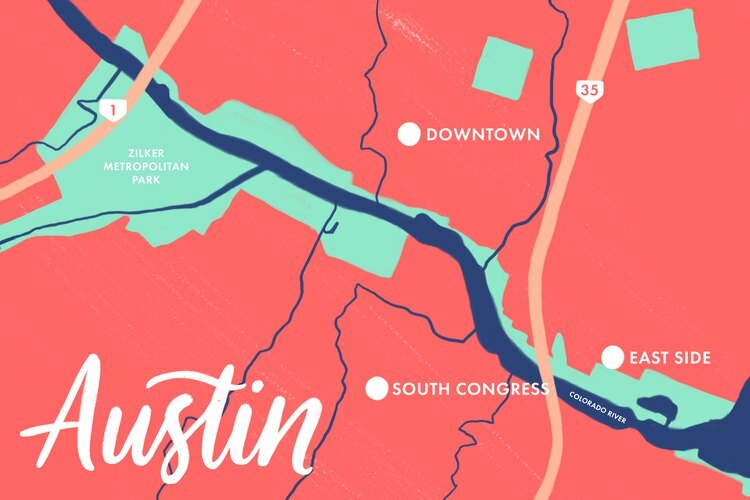 Most of South Congress has a dedicated bike lane — which also connects to one of the city's treasures, the 10-mile hike and bike trail along the river and Zilker Park, 1.5 miles west. Far more than just a pathway or park, this green space is an epicenter of the Austin lifestyle. The trail meanders along the water's edge with the downtown skyline as a backdrop, with numerous places to rent kayaks or stand-up paddleboards. Several B-Cycle stations also dot both sides of the river. 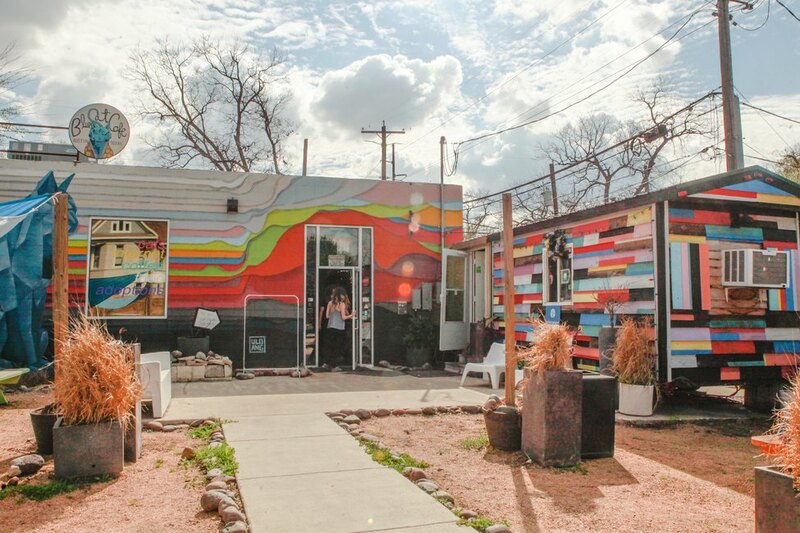 Just east across I-35 from downtown, you enter into Austin's funkiest, hippest neighborhood. Having undergone significant changes in the past five years, the East Side is home to working art galleries and studios, trendy restaurants and cocktail bars, micro-breweries and yoga studios; all set in a diverse area with strong Hispanic and African-American roots. You might start at the Boardwalk at Lady Bird Lake, a $28 million project completed in 2014 that features multiple viewing areas and piers. You can walk, run or bike ride along the Boardwalk and its connecting trails for a workout with fantastic views of the downtown skyline. See if you can spot the uniquely Austin touch: the Belting It Out art installation of 36 bronze, Western belts integrated into the railings, with Texas song lyrics embossed in them. When you're ready for coffee or breakfast, head to Cesar Chavez Street where you'll find Cenote, a coffeehouse and café in a historic 1887 house with a fantastic patio. If you fancy a cat cuddle, head three blocks east to Blue Cat Café. The first cat café in Texas, this animal-friendly spot serves vegan food and drink while promoting adoption of the felines who inhabit the café. One of the most colorful things about the artsy East Side is the street murals throughout the area. A walk or bike ride down Cesar Chavez, 6th Street or 11th Street will let you discover many of these ever-changing public art masterpieces, such as the "La Lotería" collage of Mexican lotería cards and a painting of Tejana singer Selena; and "Let's Band Together" at Whisler's — a fantastic bar to stop in at, with its treasure of salvaged materials found throughout. 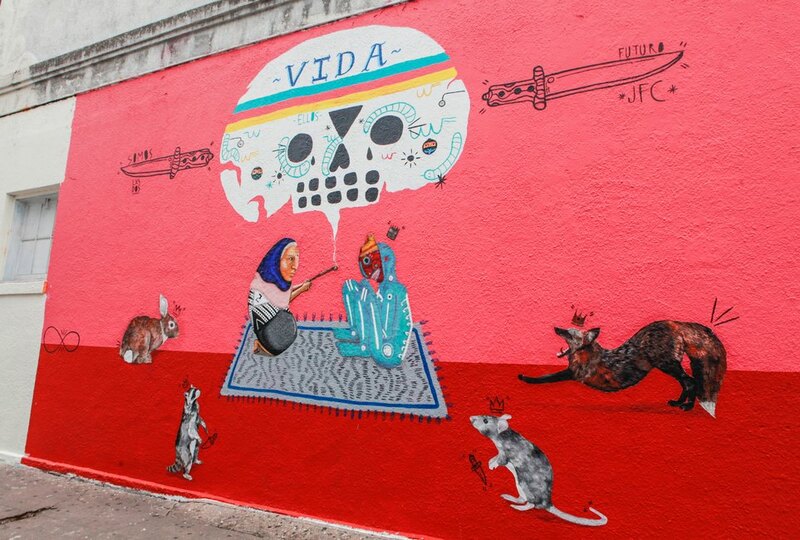 SprATX (Pedernales and Cesar Chavez) is also a good hub for discovering Austin street murals; the creative agency and artist collaborative supports talent from all over the globe, with a mural wall on the side and frequent exhibitions in the spaces. You can also pick up your own supplies from their art store! 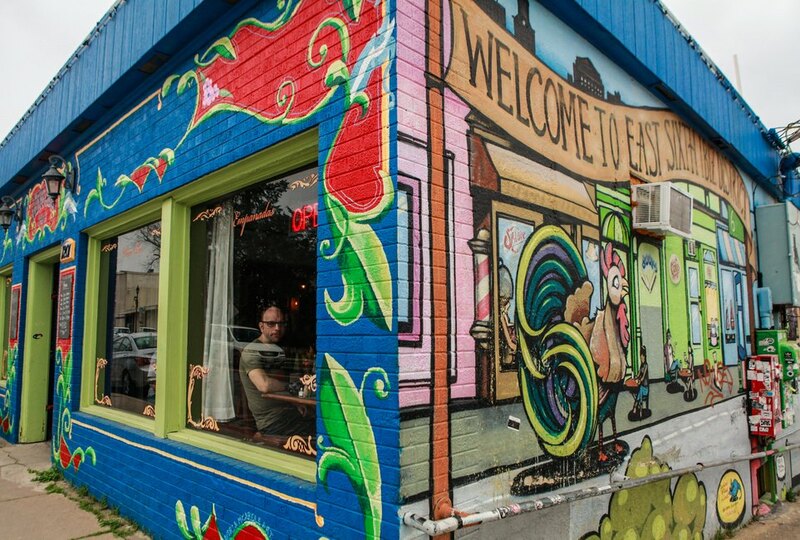 If wellness and yoga is your thing, East Austin is a great place to be. Right around the corner from SprATX you'll find Soma Vida, a coworking and wellness community with yoga and meditation classes, massage, and lots of rotating events and workshops. For a healthy lunch, you can grab some of Austin's favorite vegan tacos at the Vegan Nom food truck in Soma Vida's courtyard; or cross the street to Counter Culture, a local favorite for vegan comfort food. 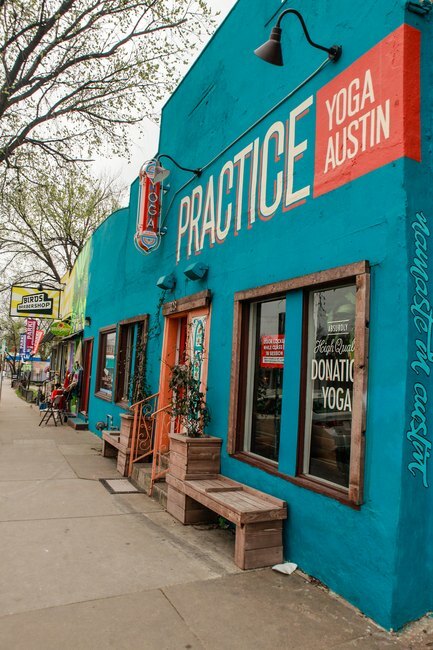 If you head over to East 6th Street you'll find Practice Yoga, offering drop-in, donation-based classes. It's located in a great little section of 6th surrounded by restaurants, markets and shops. A treasure here for authentic Argentine food is Buenos Aires Café, an art-filled space run by Argentina native Reina Morris and her daughter, Paola Guerrero Smith. An insider secret is their Milonga Room, a hidden little jazz bar at the back of the building with live music and incredible cocktails. You need a reservation, which will unlock a password for entry. If you're into craft beer, you've come to the right place. 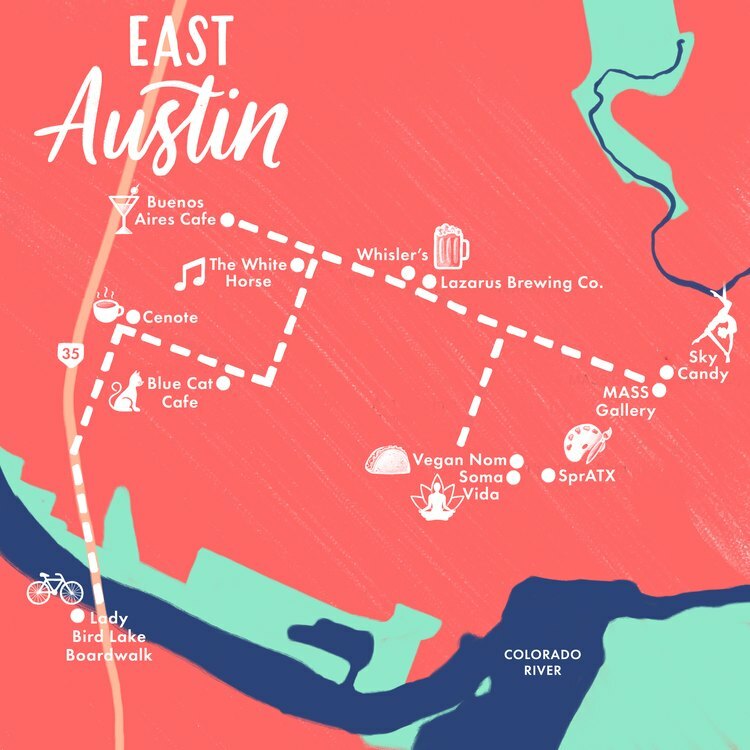 While the city has a lot of microbreweries, East Austin boasts a large number within walking distance from each other. Lazarus Brewing on 6th Street is one of the newest, in a beautifully restored space. They also make some fantastic kombucha and root beer in-house. 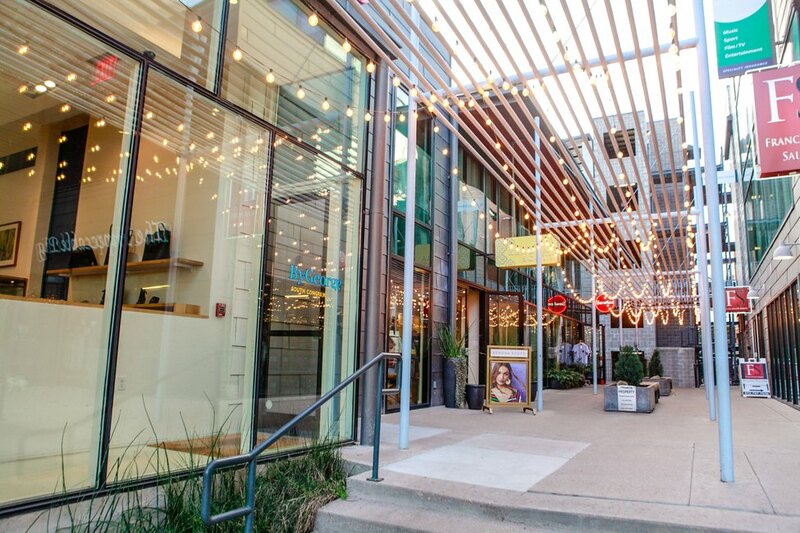 Others along the street that are absolutely worth checking out are Zilker Brewing Company and Hops and Grain — located in a complex where you can soak up some of the East Side's awesome art scene at Mass Gallery; or try your hand at aerial arts with Sky Candy. Once nighttime falls, the East Side really comes alive. 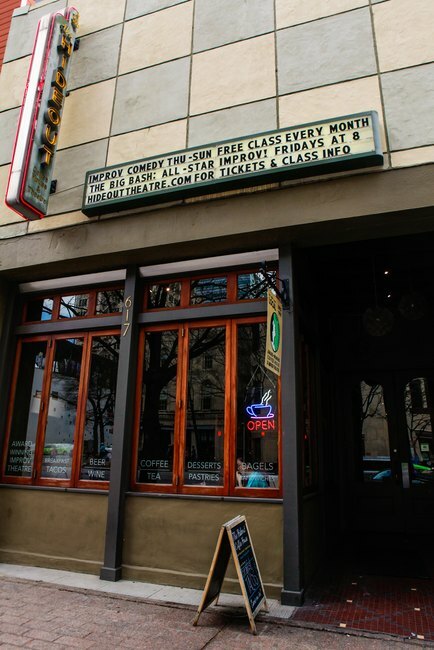 There is no shortage of quality bars and lounges throughout the neighborhood, but if you like to dance — or simply want to experience a true Texas honkytonk — head over to The White Horse. 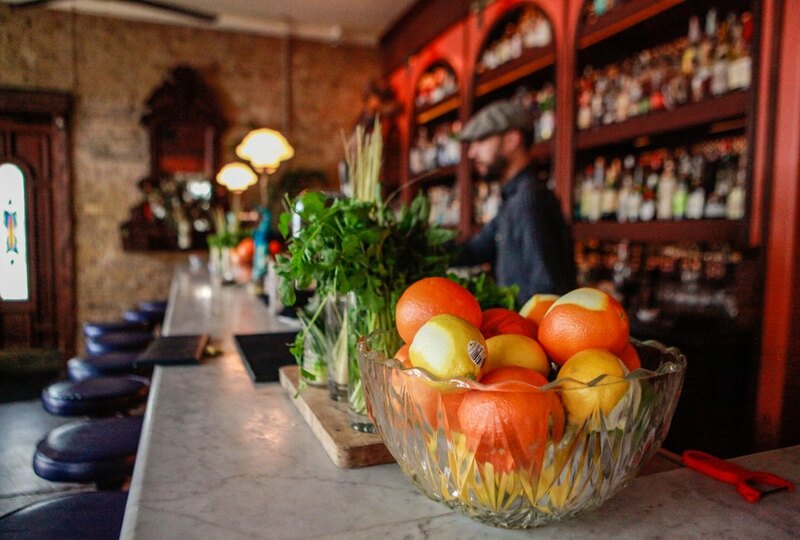 Live music and dancing every night, good cocktails that won't break the bank, and a killer vibe make this the number-one, don't-miss nightlife spot in East Austin. Shelley Seale is a freelance writer based in Austin. She loves books, dogs, travel, yoga, indie movies, food and wine, though not necessarily in that order. Follow her on Twitter @ShelleySeale.